Gatwick Airport features two terminals linked by a people carrier. Branding and directions towards the Cathay Pacific check-in are clear throughout, and this is located at the South Terminal. Since this is the same terminal as the railway station, the walk to check-in is less than 5 minutes and very convenient. The check-in area is quite atypical and appears to be trialing modern technology and new self-check-in points and self-bag drop. There is a bank of new looking self-check-in terminals with exclusive CX branding on them. This is intuitive and fast, allowing seat reselection even after checking in online. From there, the customer has documents checked and proceeds into the self-bag check area. Business Class/Frequent Flyer desk is staffed but quite spartan, and premium customers are essentially forced to use self-check-in machines. There are uniformed Cathay roaming staff here, and due to travelling light, I do not get the chance to trial the self-bag drop machines which look futuristic. Queues at security are modest. The crowds are upended into a vast, brightly-lit maze of Duty Free real estate and bombarded with free samples, sprays and beaming salespersons. When you finally find the way out, it is into an apex of food and beverage options to suit most tastes. The crowds here are staggering and LGW practices not informing customers of the boarding gate until 50 minutes before departure, presumably often to maximise passenger spend as our aircraft has been parked at Gate 19 since 7am this morning. Boarding begins on time and I am processed by a friendly agent, and despite a near-deserted boarding lounge, the flight turns out to be 80% full. There is a selection of newspapers at the aircraft door. Economy class on an A350. 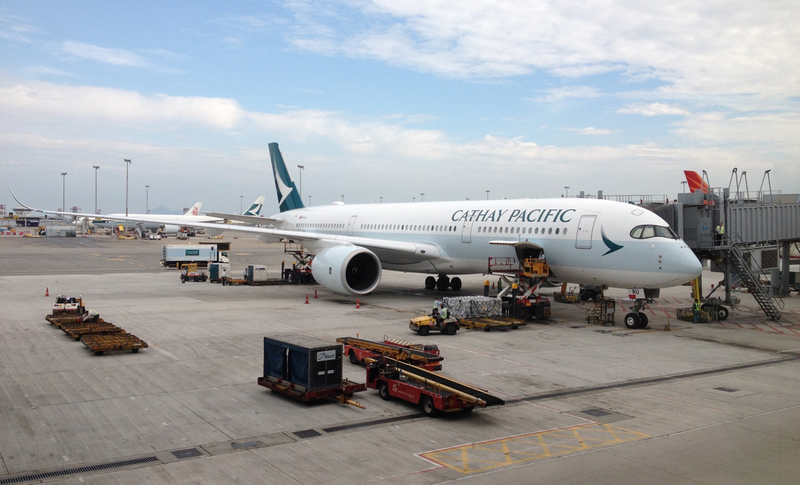 Cathay Pacific has only recently branched out of its traditional UK hub of London Heathrow. Firstly, with Manchester and now Gatwick . The route is still relatively young and is flown by an A350 aircraft. Cathay Pacific offers a baggage allowance of up to 30kg in Economy class, with 7 kg hand luggage. Any Duty-Free purchases must subsequently be included in this allowance. Checks were not made regarding my hand luggage overall weight. The Economy seat and spacious and offers plenty of legroom over a longer sector. Seats are all slim and there feels like a lot of room to move within the living space. There is a slight special advantage of the A350 (vs Boeing 787) with a wider cabin overall but the same 3-3-3 configuration. Each seat is enhanced by the extra-large PTV screen and controller, USB charger and outlet all conveniently located in the seatback area. The seat has other advantages, such as a secondary ledge that folds out to allow PEDs/tablets to be placed at eye level for watching personal media. This has a small net pouch too in case of charging PEDs, as well as a cup-holder meaning the larger tray table only really needs to be used at meal times or if working. The seat is comfortable, and headrest adjusts and is easy to achieve some rest in. Upholstery throughout aircraft is a light green colour in keeping with the airlines wider brand. The seat area was very clean, and the aircraft feels new and fresh. Despite there being an empty middle seat, this was soon colonised by my seatmate who upended all her belongings into the space, plugged USBs into the central seat and eventually swung her feet around when she was ready – toes periodically poking my thigh. The cabin has a light, green pastel theme and feels quite intimate on the A350. There are no galleys mid-cabin as this is consolidated into large forward and rear galleys. The rear galley has a central podium table where snacks are placed during the flight for customers to help themselves. There are 6 washrooms on the A350 and queues were not observed at any time. The cleanliness of these varied during the flight and the staff could do more to keep these in better condition. Basic in-house toiletries are provided. Boarding is completed on time and the crew distribute menus at this time. However, an announcement from the flight deck scuppers all hopes of an on-time departure, due to thunderstorms around Gatwick. In the end, the delay amounts to around 55 minutes with a late arrival into Hong Kong 30 minutes behind schedule. Throughout all the delays the jovial flight deck keeps us very well informed. A very appealing menu is given out upon boarding. It features just food choices and is on high quality paper. 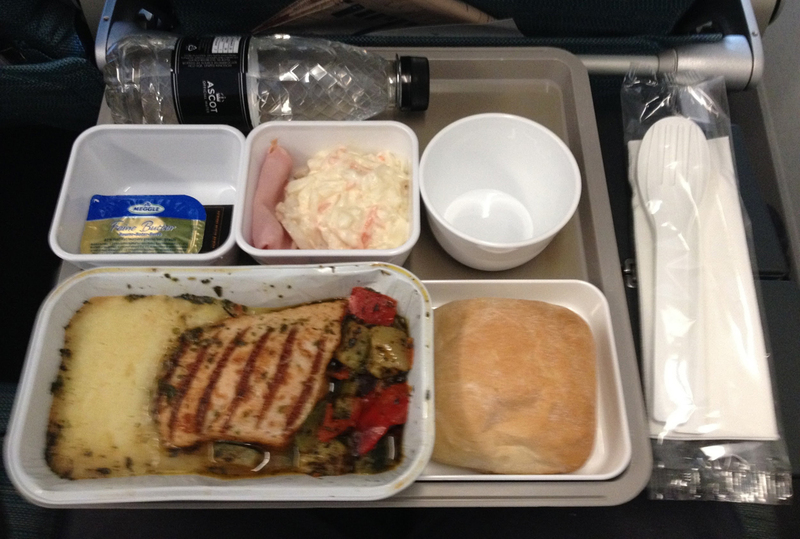 The first meal service commences very quickly especially given the initial very bumpy ascent out of Gatwick. Being at the rear of the cabin, it takes a further 30 minutes to reach me. There is only a single meal cart for the entire cabin, so the process is a little slow to complete. The meal is served before the drinks unusually, especially given the drinks comes with a nice packet of salted peanuts. The choices are (1) a vegetarian lasagne (2) roasted chicken and mash or (3) pork and rice. I go for the middle one. The tray is minimalist but visually appealing, with heavy, deep side-dishes. The sleekest part of the meal tray is the cutlery which all fits into one another with satisfying ergonomics. It is plastic, yet solid and practical. The starter is a simple ham and coleslaw salad which was tasty. The accompanying bread roll is well heated (despite being seated at the rear of the cabin), crusty and freshly baked. Entirely delicious with glob of Lurpak butter. The main course of roast chicken was delicious, with Mediterranean flavours. It is grilled, moist and of high quality. The mash was also praiseworthy! Smooth, rich and very tasty in the accompanying garlic butter of the dish. There are Mediterranean roast vegetables to accompany. The dish was very hot when served and was excellent all-round. There is a nice block of artisan chocolate to conclude the whole meal on a sweet, classy note. As we are at the rear, the ice-cream is served almost immediately after the tray is given out – Movenpick chocolate. Overall an excellent lunch experience. Snacks are available on request or at the rear of the aircraft. These were good quality, including crisps, cookies and flapjacks. There are also instant noodles available, produced in house for CX which were tasty. The second meal is served only 80 minutes prior to landing so does not disturb customers too much. The lighting is not put up fully so customers may comfortably continue resting. The pre-arrival tray consists of either an egg or noodle dish. I select the chicken and noodles, and the meal tray includes fruit, a roll and jam. It was disappointing that a croissant was not offered. The time taken to retrieve trays was also very good on CX as it can be an annoyance when these sit around for a long time – the rear section of the cabin are gathered in on a one-to-one basis, creating a more personal service. All seats have personal TVs, and the CX entertainment system was excellent and quite extensive. The A350 features additional live TV channels as well as on board WiFi. The pricing for the WiFi was reasonable, although there is no free option to promote the service. The library of films, music, TV shows, games, live maps and cameras views make the time onboard pass swiftly. The cameras are of high quality on the A350, making watching the landing into Hong Kong very enjoyable. All titles can be searched for using a search function, which produces all the appropriate results. There are a wide range of new release Hollywood titles, as well as extensive international and Hong Kong cinema titles. The TV selection is also broad, and it is quite clear where an entire series is available. Advertising can be somewhat overwhelming as it is shown before each new episode and film. It can last over 2-minutes in most cases. Headsets sit over most of the ear. They are comfortable to wear and had a decent quality of sound. Personal headsets also plug in with ease. No additional amenity kits are available on today’s flight, and even though this leaves during the day time it would be a good enhancement to offer dental kits and sleeping masks. Blanket and pillow product is tastefully designed and made of a nice fabric, as opposed to the synthetic blankets sometimes experienced. The cabin staff do not gather in any items prior to landing. The staff service onboard is good overall. There is a sense of teamwork throughout all the services, and this is led by a fluent, confident purser who makes herself seen at the entrance and once or twice within the economy cabin. The crew are hardworking throughout the flight, and although not a great deal of water runs are noted (bottles are handed out), the staff were good at responding to call buttons. Language abilities were good throughout. Some staff were a little glum, but the overall impression is cheerful and positive. Staff were not overly chatty to customers in the back-galley area and there was a feeling of encroaching when I visited here. Lights in the cabin are brought up around 40 minutes prior to arrival into HKG. The lighting was sensitive onboard, and crew maintained a nice atmosphere for resting. Throughout the flight it was never entirely darkened, but staff were quick to ask all customers to close window shades and did not raise mood lighting until the last minute. We arrive with a 30-minute delay and there are staff to assist customers with a short connection on the ground. The transfer point is adjacent to the gate. HKG has these dotted throughout to ease transferring walking distances. I have pre-registered for the frequent visitor programme, which is free to qualifying nationalities who visit more than three times a year. This affords the same ease as a resident in passing immigration and is of benefit given queues can become large at HKG. 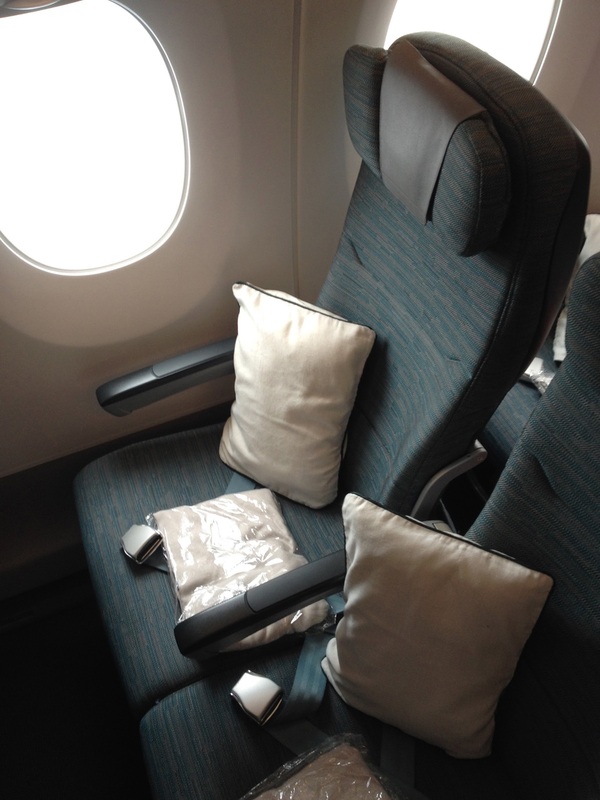 This was a positive flight experience with Cathay Pacific. The airline brings efficiency, professionalism and quality to all aspects of the travel experience, from the new check-in appearance, to excellent onboard service and an organised, well-practised pre-arrival procedure and good ground presence at HKG. The seat onboard the A350 is comfortable and convenient, with added features such as easily accessible socket/USB and support for tablets/PEDs offering convenience to the confinements of an Economy Class seat. 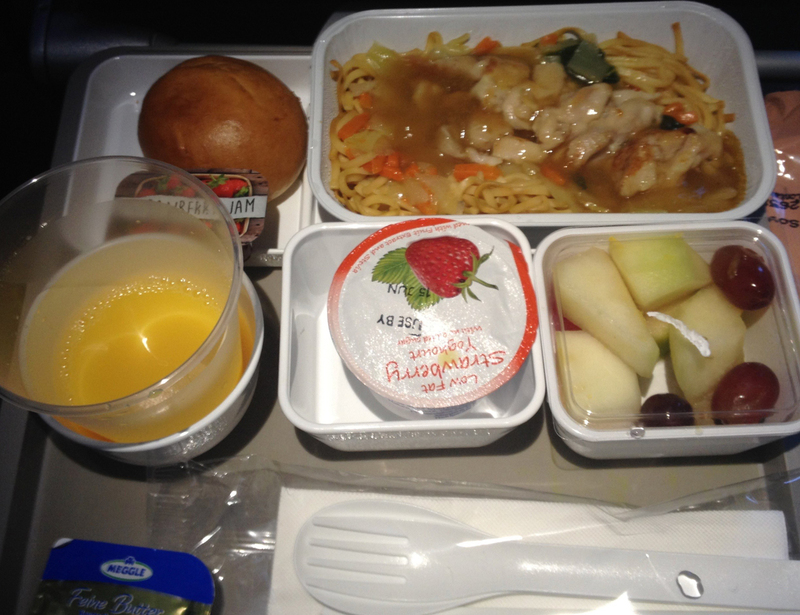 The catering product onboard was strong and stuck in my mind even after leaving the aircraft, a boon for airline food. Staff were a little less memorable, but professional and friendly overall. This flight report is based on fully paid tickets, not airline discounted or complimentary tickets.